Wanted army of rogue one stormtrooper loose mint complete damaged carded or mint carded as long as the price is reasonable looking for 50 at least Don t want to buy single units but lots pm me thanks. 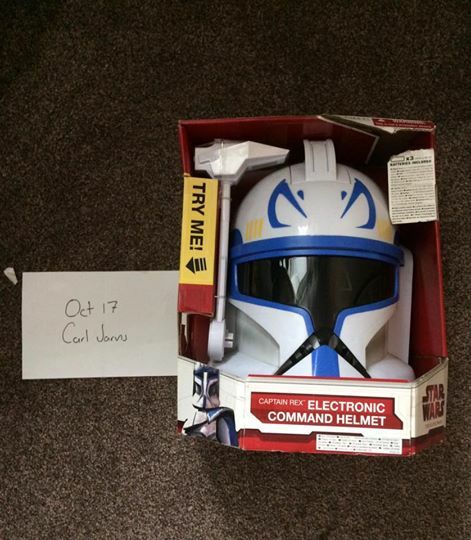 Does anyone have one of these helmets they are willing to sell - it's for my daughters birthday so would love it to be new and boxed if possible. Mate ive found you 1! Not the same model but its Captain Rex. Its on a toy traders site on facebook. He's in Wolverhampton and wants £45 plus postage and fees. Let me know if interested and ill do the negotiating for ya's. Col mate i've got a couple of loose clone helmets which you are welcome to borrow. Probs sounds a bit of a ludicrous idea but it's there if she gets desperate my mate. Looking for carded Unkar Plutt, Captain Rex, Finn FN-2187 and Vader on Force Awakens cards to finish off the set. Not looking to pay through the nose or anything, especially as most characters are going for 3 quid in Home Bargains, I just can't find these last ones. chiffy wrote: Col mate I've got a couple of loose clone helmets which you are welcome to borrow. Probs sounds a bit of a ludicrous idea but it's there if she gets desperate my mate. Should have one arriving tomorrow that I got cheap off of ebay that will do the trick for the game launch tomorrow - should have been here today but it's getting delivered by hermes so no surprise that it's late. If it does they'll be looking pretty damn cool in the store - I'll share some pics. Does anyone have a Canadian VC02 Leia Hoth for sale? Shipping costs are stopping me buying from eBay. Checked our shops - couple of y wings for a tenner and a first order snow speeder but it was £16.99.